This image of the Palace is courtesy of local artist Joe Howard. Check out more of his work here. 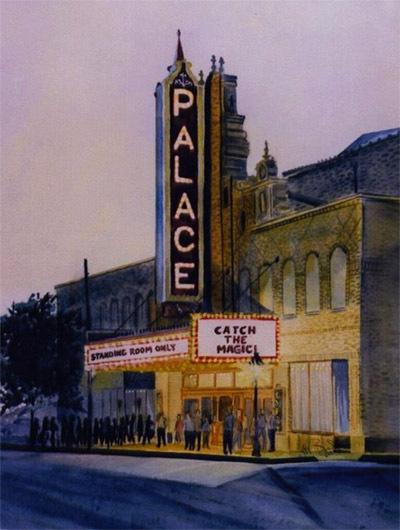 When the people of Marion think of the Palace Theatre, they’re probably more apt to think of great live entertainment than ghosts. However, a few inexplicable events at the Palace over the years have led to rumors that it may have a spook or two. Anyone who’s ever been in the Palace would certainly attest that its design – the plush red seats and curtains, the dim lighting and the way the darkness hanging above the audience makes the interior appear larger than it actually is – lends it an otherworldly quality. We’ve included a few of these uncanny incidents in Haunted Marion, Ohio, and we’re sure there are even more strange stories about the Palace waiting to be heard. I grew up in the Palace and spent many hours alone at all times of night and have never heard of any stories or experienced anything unusual. If anyone has any stories I would be interested in hearing them.